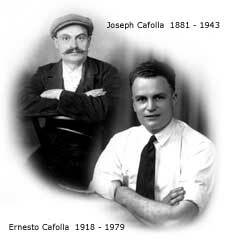 Established by Joseph Cafolla in 1900 after his arrival in Lurgan from Casalattico in the Casino area of Southern Italy. Currently operated by Gerard Cafolla (son of Ernesto and grandson of Joseph) and his wife Marie. The present site in Lurgan town centre has been the family home and business since 1932 and is known locally as 'the wee Cafollas'.